Autumn seems to have passed in London and we're moving onto the bare trees and cold air that winter brings. 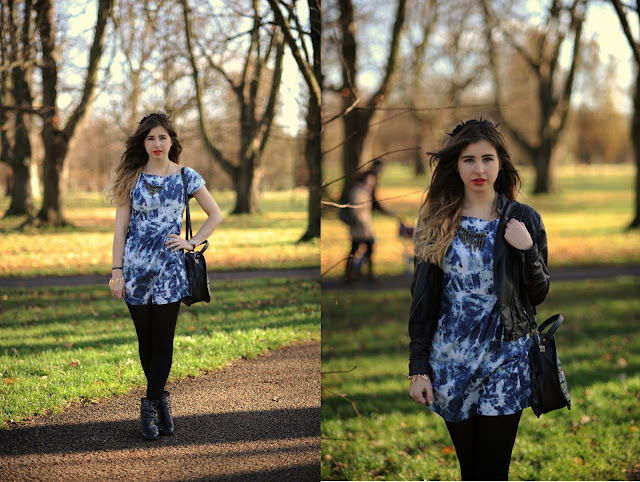 This week's photos were shot in Kensington Gardens on a sunny Sunday morning. I am wearing my latest eBay bargain, this tie dye denim dress (£9!). 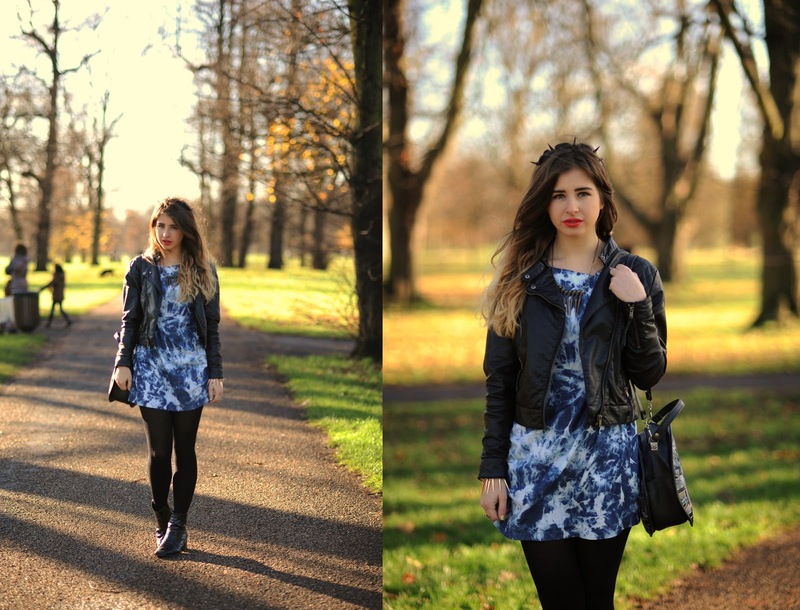 I really like the grungey effect the dress brings and though I'm normally not a massive fan of the tie dye trend, I made an exception with this little number. I've paired the dress with a black leather jacket which I haven't worn in a good while, plus black tights and patent Chelsea boots. You can also say hello to my new black flower and spiked headband which rarely leaves my head lately. I bought this one from a seller on Etsy and although it took about 3 weeks to arrive, it was definitely worth the wait. I have been YOLO-ing (forgive me for using this term) when buying online lately. I'm really loving the current trends and there are so many things I want to buy. Its so difficult being a skint student! I go through stages of being all 'oh but I really shouldn't'... to ... 'but I'm a fashion student - its retail research'. I guess even student budgets can't tame a shopaholic! On the plus side, my recent buys do mean I've not more things to show you guys; keep a look out! I had the pleasure of attending the Dahlia Christmas blogger's event last week at their central London store. It was so lovely to meet bloggers such as Olivia from What Olivia Did, Camilla from Into The Fold and Livvy from Tea Toast Fashion! I admire these girls so much and it is kinda strange seeing people in real life that you only ever see through a screen - a little starstruck! In other news, I'm in the process of changing my URL to helloomonica.com - exciting stuff. Eeek soon I'll have my own website! Established or what. Finally, I just wanted to thank those of you who read my blog for your continued support. Last week I hit 600 followers via GFC so a big thanks! love the dress! :) It was lovely meeting you too of course! Cute headband and I loveee your dress. Oh Monica, your outfits are always such an inspiration. Love them to pieces! Lovely dress, and amazin style!!! congratulations for your blog! I follow you!!! wer have a similar style!! !